Q) Can I eat avocados? A) In Phase 1, no, because an avocado is a fruit. In Phase 2, in a 150g portion of avocado, there are 23g of fat and 11g of carbohydrate. Avocados are, therefore, higher in fat than carbs, but have quite high levels of both. This means you should eat them in moderation in Phase 2 and have them as part of a fat meal on the occasions when you do have them. In Phase 3 – cheat with them as much as you can and want to. I have stopped losing weight, I am continually i.n phase 1, however no weight loss. Hi I’ve read the book & starting phase 1 today. Can you confirm regarding the yogurt. I’ve hunted for the NLY and can only find Yeo and they are all flavoured. Ie. Vanilla, lemons curd etc. Are we allowed them? Hi going to start diet tomorrow and would like to know if you can eat rice cakes on p1 and do they have to be plain! Hi would making a cheese sauce with some flour make a lot of difference ? Also would it be better to use corn flour. I lost 3st and maintained for 18 months but put too much extra on over Christmas so only looking to loose 7lbs or so . As long as you don’t have a problem with wheat, you can use a small amount to thicken sauces. Corn flour is a good alternative. That would be fine on Phase 1 as mixing is allowed. Not for Ph2, though. Any knowledge of ME ( myalgisk encefalomyelit) ?? My wife is suffering from this! I’m really enjoying the first few days of The Harcombe Diet! But, please can you tell us which cereals we can eat on Phase 1? I’ve studied all the boxes in my local supermarket but can’t see anything that looks suitable and I’m getting a bit bored with porridge oats. Thanks! Thanks so much Zoe, really appreciate it! I have bought your books and am keen to start but have been on the Cambridge diet (and now am unwell). Just wanted to check if you think I will put weight on after not eating real foods, have been up and down and sick of daddy diets, really desperate to start your regime. 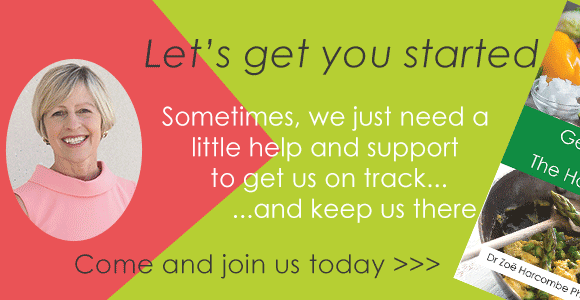 Hi Kim – let the club help you through this (http://www.theharcombedietclub.com/) It’s free to post (moderated) and from £1 a month unmoderated. We’ve had a number of people come from very low cal liquid diets and done very well. There may be some initial regain but not necessarily (one woman switched from several stone down on Lighter Life and continued to lose on The Harcombe Diet) and any rebound should be recoverable once you commit to real food as a way of eating. Which book should I get first to start the diet? 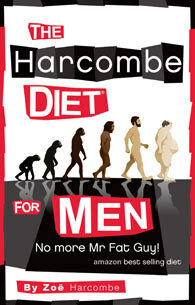 I’d recommend The Harcombe Diet for men if you’re Alan! If you’re a female borrowing a male’s email log in – I’d recommend the Stop Counting Calories & Start Losing Weight. My husband and I have been on the diet for a few weeks. We would now like to add a few sweets to our menu. a) FlapJack Made with oats and honey. Hi Marlene – check out the recipe book – there are lots of safer sweet options in it, but sweet stuff is generally for Phase 3 cheats. (The honey question is in the diet book). You can try introducing 85% cocoa dark chocolate into Phase 2. If you want to carry on losing weight, you are safer to stay off sweet stuff and leave it till Phase 3. If you don’t mind slowing your weight loss or are OK maintaining, then you can follow the rules for cheating. Strawberries and cream should be as sweet as you desire or I would suspect you still have cravings going on! I have done a lot of research into your diet, which sounds amazing. I hate meal replacement diets and don’t believe in them long term, and like healthy foods, so this sounds suited to me. I am 5ft 3in and have weighed 11st6lbs at my heaviest. I weigh between 9st and 9st 7lbs from healthy eating but want to lose half a stone more and keep it off. I seem to keep bobbing up and down half a stone, sometimes more, because every time I have anything remotely ‘naughty,’ I gain weight! Do you think the diet will help me or, because I am a normal bmi/weight etc.. will I not lose any weight? I’m generally quite a healthy eater, drink the odd glass of red wine and drink loads of water daily….. Try Phase 1 (only 5 days and you may well clear up bloating, headaches, blood sugar swings and any other irritations that you may have). Stick with Phase 1 if you are doing well with it and see if this helps you find your natural weight. You should be able to be below 9 stone very healthily and 8 stone 7lbs would give you that ‘perfect’ BMI. If you don’t lose any, or lose and find you gravitate easily back to 9-9.7, that’s likely your natural weight. I would be surprised if it is though and would be hopeful that 8.7 – 9 stone could be achievable. Hi Keith – all parts of animals are great. Liver, kidneys, offal, tongue etc are especially nutritious foods. Liver and egg yolks are probably the best 2 sources of vitamins and minerals all round. Not listed in the meats catagory are chicken livers, other livers. tongue. Are they allowed. Hi Keith – I hope your wife is pleased with the weight loss – that’s brilliant! 1) weight and blood pressure are very closely connected, so losing weight will invariably lower blood pressure directly. 2) Water retention affects blood pressure and this diet helps to overcome water retention quickly and effectively. This will also have naturally reduced blood pressure. I can only help with weight loss – your wife needs to work with her doctor on blood pressure. It sounds like her need for tablets needs to be reviewed as soon as possible as she has naturally and healthily lowered her own blood pressure and may well have less need for medication going forward. Thanks for your reply. Have ordered the green book. 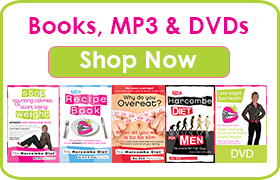 Hi Keith – the best one is the (green) Stop Counting Calories & Start Losing Weight diet book. You can eat fruit after 5 days, provided you don’t have Candida/Hypoglycaemia problems – the book will explain everything. P152 covers (coffee and) wine. Red wine can also be included in Phase 2 (although it is considered a ‘cheat’). You can try a glass with the occasional evening meal (not every night). I always say to people the choice is yours – you can be very strict and lose weight quicker or be a bit more flexible and maybe get away with it, or maybe lose a bit slower. The diet is yours to play with! Can I eat fruit in any phases of the diet. I have an Hardcombe diet from a magazine it is for 7 days. Hi, about to start phase one tomorrow. So motivated. Can we eat tomatoes on a salad? Hi i am just starting the Harcombe diet and i am really keen but i have one and only thing i don’t like and can not eat and that is Natural Live Yogurt!!! i really want to eat it and i have tried but it really does make my stomach churn. is there any thing i can add to it or a different type of yougurt? i have also tried the greek and the same!! i am a sufferer of candida so could do with eating it!!! i am on Phase 1 too!! !